"The Gateway to Newfound Lake"
Bristol is a town in Grafton County, New Hampshire, United States. The population was 3,054 at the 2010 census. It is home to Wellington State Park, Sugar Hill State Forest, and Profile Falls on the Smith River. Surrounded by hills and lakes, Bristol includes the lower two-thirds of Newfound Lake, a resort area. 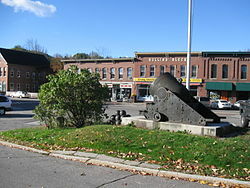 The primary settlement in town, where 1,688 people resided at the 2010 census, is defined by the U.S. Census Bureau as the Bristol census-designated place (CDP) and is located at the intersection of New Hampshire routes 3A and 104. Bristol was taken from Bridgewater and New Chester (now Hill) and incorporated 24 June 1819. Colonel Peter Sleeper, Benjamin Emmons and others commenced a settlement here in 1770. Extensive deposits of fine sand or clay similar to the "Bristol sand" used in Bristol, England, to make fine china and pottery gave the town its name. Here the sand was used to make a superior quality brick, marketed as Bristol brick. With water power from the Pemigewasset River, the town was a center of manufacturing in the early days for goods such as paper, leather, woolens, flannel, bedsteads and piano stools. On January 16, 1884, the town of Bristol voted to accept the gift of a library building and land from Josiah Minot and Solomon Sleeper and to manage and maintain a public library. The Minot-Sleeper Library became the first building erected to specifically house a public library in the Lakes Region at the time, when it was officially opened to the community in 1885. On August 15, 2012, a groundbreaking ceremony was held in celebration of the library's expansion. In February 2013, the new addition was ready for use. Bristol is one of four towns with shoreline on Newfound Lake, which has been a tourist destination since the mid-19th century. Farmers at first rented rooms and provided meals, but in the 1870s, hotels including the Hotel Bristol and G. G. Brown Hotel were built. In 1874, Bristol was the terminus of the Franklin and Bristol Branch railroad. The New Hampshire Central Railroad was planned to pass through Bristol. In the 1920s, W. F. Darling created a compound of about one hundred cottages for rent, first known as Hiland Park and later as Bungalo Village. In 2004, the compound was sold to a proprietor who sold individual cottages to permanent owners. According to the United States Census Bureau, the town has a total area of 22.4 square miles (58.0 km2), of which 17.1 square miles (44.3 km2) is land and 5.3 square miles (13.7 km2) is water, comprising 23.43% of the town. Bristol is drained by the Pemigewasset River (forming the southeastern boundary of the town), the Smith River (on the town's short southern boundary) and the Newfound River, draining Newfound Lake and most of the center of town. The highest point in town is Bristol Peak, elevation 1,803 feet (550 m) above sea level. Bristol lies fully within the Merrimack River watershed. Bristol is served by state routes 3A and 104. As of the census of 2010, there were 3,054 people, 1,283 households, and 851 families residing in the town. There were 2,488 housing units, of which 1,205, or 48.4%, were vacant. 1,089 of the vacant units were for seasonal or recreational use. The racial makeup of the town was 96.9% white, 0.3% African American, 0.2% Native American, 0.7% Asian, 0.0% Native Hawaiian or Pacific Islander, 0.3% some other race, and 1.6% from two or more races. 1.1% of the population were Hispanic or Latino of any race. Of the 1,283 households, 29.3% had children under the age of 18 living with them, 49.0% were headed by married couples living together, 11.1% had a female householder with no husband present, and 33.7% were non-families. 26.7% of all households were made up of individuals, and 9.5% were someone living alone who was 65 years of age or older. The average household size was 2.36, and the average family size was 2.81. In the town, 21.5% of the population were under the age of 18, 7.0% were from 18 to 24, 23.6% from 25 to 44, 32.4% from 45 to 64, and 15.5% were 65 years of age or older. The median age was 43.5 years. For every 100 females, there were 98.2 males. For every 100 females age 18 and over, there were 95.3 males. For the period 2011-2015, the estimated median annual income for a household was $50,080, and the median income for a family was $56,161. Male full-time workers had a median income of $43,627 versus $35,921 for females. The per capita income for the town was $25,353. 8.7% of the population and 5.0% of families were below the poverty line. 15.4% of the population under the age of 18 and 4.3% of those 65 or older were living in poverty. ^ Coolidge, Austin J.; John B. Mansfield (1859). A History and Description of New England. Boston, Massachusetts. pp. 429–430. 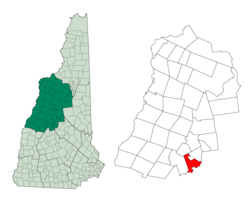 ^ "Geographic Identifiers: 2010 Demographic Profile Data (G001) - Bristol town, New Hampshire". U.S. Census Bureau American Factfinder. Archived from the original on September 11, 2013. Retrieved November 10, 2011. ^ a b c "Profile of General Population and Housing Characteristics: 2010 Census Summary File 1 (DP-1): Bristol town, Grafton County, New Hampshire". U.S. Census Bureau, American Factfinder. Retrieved October 30, 2017. ^ "Selected Economic Characteristics: 2011-2015 American Community Survey 5-Year Estimates (DP03): Bristol town, Grafton County, New Hampshire". U.S. Census Bureau, American Factfinder. Retrieved October 30, 2017. ^ "Pattee, Fred Lewis". Penn State Libraries. Pennsylvania State University. Retrieved 3 May 2015. This page was last edited on 14 November 2018, at 19:29 (UTC).